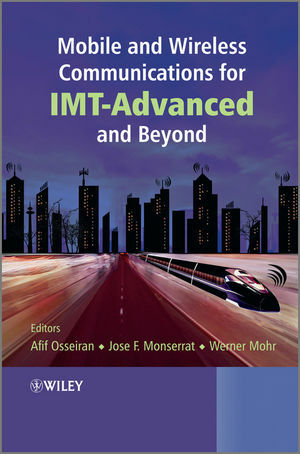 A timely addition to the understanding of IMT-Advanced, this book places particular emphasis on the new areas which IMT-Advanced technologies rely on compared with their predecessors. These latest areas include Radio Resource Management, Carrier Aggregation, improved MIMO support and Relaying. Each technique is thoroughly described and illustrated before being surveyed in context of the LTE-Advanced standards. The book also presents state-of-the-art information on the different aspects of the work of standardization bodies (such as 3GPP and IEEE), making global links between them. Afif Osseiran received a B.Sc. in Electrical and Electronics from Université de Rennes I, France, in 1995, a DEA (B.Sc.E.E) degree in Electrical Engineering from Université de Rennes I and INSA Rennes in 1997, and a M.A.Sc. degree in Electrical and Communication Engineering from École Polytechnique de Montreal, Canada, in 1999. In 2006, he defended successfully his Ph.D thesis at the Royal Institute of Technology (KTH), Sweden. Since 1999 he has been with Ericsson, Sweden. During the years 2006 and 2007 he led in the European project WINNER the MIMO task. From April 2008 to June 2010, he was the technical manager of the Eureka Celtic project WINNER+. Dr. Osseiran is listed in the Who's Who in the World, and in Science & Engineering. He has published more then 50 technical papers and has in 2009 co-authored a book on Radio Technologies and Concepts for IMT-Advanced with John Wiley & Sons. Since 2006, he has been teaching at Master's level at KTH. Jose F. Monserrat received his MSc. degree with High Honors and Ph.D. degree in Telecommunications engineering from the Polytechnic University of Valencia (UPV) in 2003 and 2007, respectively. In 2009 he was awarded with the best young researcher prize of Valencia. He is currently an associate professor in the Communications Department of the UPV. His research focuses on the application of complex computation techniques to Radio Resource Management (RRM) strategies and to the optimization of current and future mobile communications networks, as LTE-Advanced and IEEE 802.16m. He has been involved in several European Projects, acting as task or work package leader in WINNER+, ICARUS, COMIC and PROSIMOS. In 2010 he also participated in one external evaluation group within ITU-R on the performance assessment of the candidates for the future family of standards for IMT-Advanced. Werner Mohr graduated from the University of Hannover, Germany, with a Master's degree in electrical engineering in 1981 and a Ph.D. degree in 1987. He joined Siemens AG, in 1991. He was involved in several EU funded projects and ETSI standardization groups on UMTS and systems beyond 3G. In December 1996 he became project manager of the European ACTS FRAMES Project until the project finished in August 1999. This project developed the basic concepts of the UMTS radio interface. Since April 2007 he has been with Nokia Siemens Networks GmbH & Co. KG, Germany, where he is Head of Research Alliances. He was the coordinator of the WINNER Project in Framework Program 6 of the European Commission, and the Eureka Celtic project WINNER+. Dr. Mohr is an IEEE Senior Member. He is a co-author of the books Third Generation Mobile Communication Systems and Radio Technologies and Concepts for IMT-Advanced.